In its day, the 400-horsepower Ferrari 500 Superfast was a car without equal – breathtakingly beautiful, expensive and, yes, very fast. As an ultra exclusive successor to the 400 Superamerica, only 36 examples were ever built through 1967 in two series, purchased by such individuals as the Shah of Iran and Peter Sellers, to name but a few illustrious clients. The 500 Superfast presented here, a series I example, is a very special car indeed, as it was ordered new by the late Lord James E. Hanson, a successful businessman and prominent member of the British nobility. During one of his stays at the Hotel du Cap near Antibes, he was quite taken with a Ferrari 400 Superamerica that belonged to an Italian gentleman and therefore asked his friend Sergio Pininfarina about ordering a similar one. 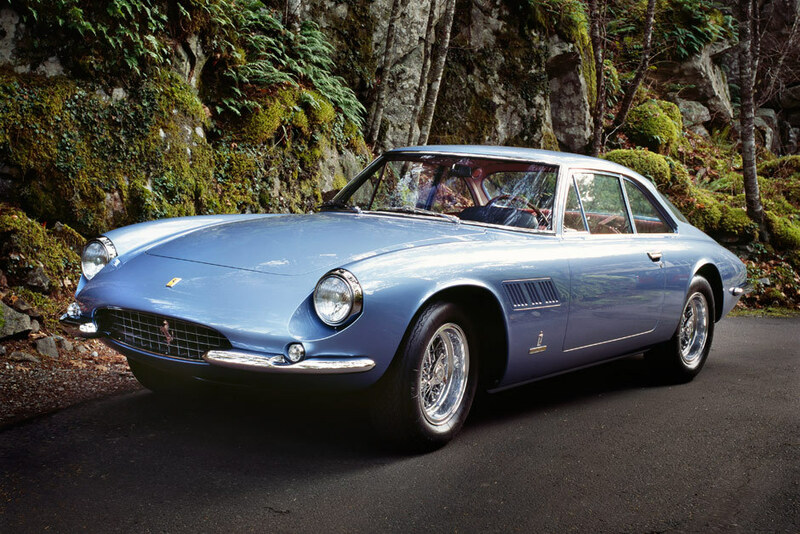 Pininfarina told Lord Hanson, however, that the Superamerica was no longer available so he elected instead to order the newly introduced 500 Superfast in May 1964. Hanson drove from his villa in the south of France on the agreed upon date to collect his car at the factory but was promptly sent back home by Enzo Ferrari, who told him he was making some changes to the braking system and other parts. Following completion, 6043 SF was initially registered on Modenese license plates (April 1965) and was sent back for servicing at the factory’s Assistenza Clienti in 1966, after about 3,000 miles. In fact, the car remained in Italy, mostly at the Pininfarina premises in Turin. It was serviced twice more at the factory and only accumulated 7,820 miles by 1972, at which point Lord Hanson finally brought the car to the UK, driving it very little. He had ordered the car left-hand drive, intending to use it for Continental touring, but as he wrote in a letter to Mr. Schermerhorn in 2001, “…my business endeavours required me to fly around the world a good deal of the time and I just didn’t have the time to drive around Europe any more.” Nevertheless, 6043 SF was always properly maintained and has always remained in as-new condition. Mr. Schermerhorn is only the car’s second owner and has given it the same meticulous care as his predecessor. While it is registered in Holland, it retains its British license plates and original registration paperwork from 1972. In addition to being shown at the Concours Paleis Het Loo, where it won Best of Show in 2001, and the Louis Vuitton Concours d’Elegance Paris in 2001, the car was also displayed during the MECC Show in Maastricht (2002). Additionally, it won its class at the Second and Fourth European Concours d’Elegance, at Castle Schwetzingen in 2002 and Düsseldorf in 2004, respectively. At Schwetzingen, it was chosen by the sponsor as the third best car in the world. 6043 SF has also been featured in Cavallino magazine (June/July 2005) and Keith Martin’s Collecting Ferrari (2004). As presented, the car has just 15,600 miles from new and is totally original, finished in its specially ordered Verde Scuro (dark green), beautifully contrasted by black leather upholstery, matching carpeting and a grey headliner. It is equipped with the special features originally ordered by Lord Hanson. These include a longer and lower passenger seat to accommodate his height, seat belts, special positions for the ashtray and window switches, a Blaupunkt Köln radio with electrical aerial, an odometer in miles and the deletion of the small parcel tray between the seats as well as the Superfast script at the rear, which he apparently considered too flashy. There was also a passenger’s footrest and padded seat cover. A very complete history file includes such documentation as the original order details and invoice from Ferrari, the original Italian libretto, factory warranty booklet, tool kit, vehicle registration (1972), a copy of the ACI card (1972), and copies of invoices from Maranello Concessionaires for numerous MOT tests. Period photography of the car in Italy and the aforementioned letter from Lord Hanson are included as well, as are more recent invoices and photo documentation from work conducted in 2004. The offering of a 500 Superfast of this calibre is a rare occurrence indeed and a unique opportunity for the true connoisseur. These cars are rarely brought to auction, much less with such well documented and prestigious provenance. It was and remains one of Ferrari’s finest gran turismos.